Prohibition Chicken would be thrilled to host your next special event. Events are organized in banquet style sit-down dinners for larger groups in our main dining area, or "cocktail party" fashion with passed drinks and appetizers in our hidden speakeasy The Volstead Room - a beautiful, historically themed party space that holds up to 50 guests. Prohibition Chicken's upscale casual atmosphere can accommodate semi-private and private group events from 10 to 100. The unique combination of our warm service, handcrafted Prohibition Era cocktails, and dining style reminiscent of Sunday night with the family creates a delicious, memorable setting for any occasion. Manager , Ryan Jenkins will work alongside you every step of the way. To check a date for availability or request information on our dining packages, please contact: ryjenkins34@gmail.com We cater as well! Call 214-222-3302 for information. Keep scrolling for information on upcoming events. 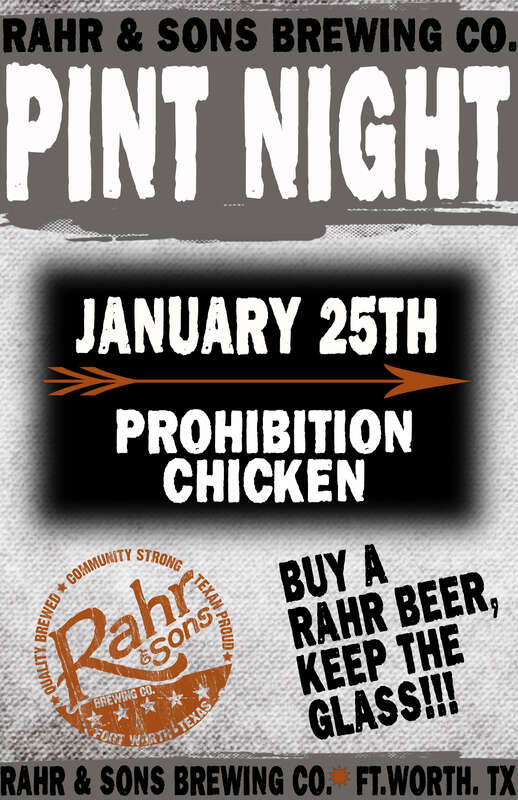 Join us for a special Happy Hour hosted by Rahr & Sons Brewing Company. Buy a pint of their Ugly Pug, Texas Red, or Bourbon Barrel Aged Winter Warmer and take your glass home! Prohibition Chicken is excited to announce The Volstead Room’s first event of 2018: “Beer, Bourbon & Bird” is a unique speakeasy dinner & drink pairing event featuring our very own Prohibition Chicken Buffalo Trace Single Barrel Select, and Old Mad Joy, a limited release Double Barrel Aged Baltic Porter from Great Raft Brewing Company. This one of a kind beer spends 6 months in Pappy Van Winkle barrels, then another 6 months in Buffalo Trace barrels, giving it a malty, oak-laden finish laced with notes of toffee, vanilla, and tobacco – a truly exquisite example of the art of brewing at its finest. Our skilled mixologist, Ryan Jenkins, will showcase our special Buffalo Trace in handcrafted, exquisitely balanced cocktails alongside four delicious courses of Prohibition Chicken’s chef driven soul food. Guest speakers Andrew Nations, co-founder or Great Raft Brewing, and Vincent Wagliardo, Brand Ambassador for Buffalo Trace Distillery, will educate us on the saga behind Pappy Van Winkle and Buffalo Trace’s role in American history, from conception to partnership with Great Raft and the legacy behind the names.